View of Alice Springs CBD from Anzac Hill. Alice Springs is a city in the Northern Territory of Australia. It is 200 km south of the centre of mainland Australia. It is about halfway between Darwin in the north and Adelaide in the south. In 2005 there were 26,486 people living in Alice Springs. 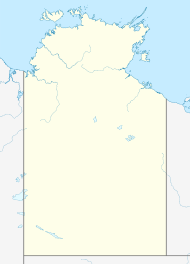 This makes it the second largest town in the Northern Territory. According to the Arrernte traditional stories, the land around Alice Springs was shaped by caterpillars, wild dogs, travelling boys, two sisters, euros and other ancestral figures. There are many sites of traditional importance in and around Alice Springs. These include Anthwerrke (Emily Gap), Akeyulerre (Billy Goat Hill), Ntaripe (Heavitree Gap), Atnelkentyarliweke (Anzac Hill) and Alhekulyele (Mt. Gillen). In 1862, John McDouall Stuart led an expedition into Central Australia and the area where Alice Springs is located. Until the 1930s the town was known as Stuart. The Australian Overland Telegraph Line that joined Adelaide to Darwin and Great Britain was completed in 1872. It followed Stuart’s route. It opened up the interior for permanent European settlement. When surface alluvial gold was found at Arltunga, 100 km east of Alice Springs, in 1887 many people began to move into the area. The road to Pine Gap - traveling any closer is prohibited! The American influence in Alice Springs comes from Pine Gap, a US satellite tracking station. It is 19 km south-west of Alice Springs. Pine Gap employs 700 American and Australians. There are about 2,000 people in the Alice Springs region who are US citizens. Australian Rules Football is a popular sport in Alice Springs. The Central Australian Football League has several teams and many people play. The sport is very popular in Indigenous communities. The local stadium, Traeger Park, can hold 10,000 people. It was built to hold national AFL and international cricket matches. In 2004, an AFL pre-season Regional Challenge match between Collingwood Football Club and Port Adelaide Football Club filled the stadium. ↑ Australian Bureau of Statistics (27 June 2017). "Alice Springs (Urban Centre)". 2016 Census QuickStats. Retrieved 18 December 2017. ↑ "2011 Census Community Profiles: Alice Springs". ABS Census. Australian Bureau of Statistics. Retrieved 15 September 2016. Wikimedia Commons has media related to Alice_Springs. This page was last changed on 25 January 2018, at 19:21.